Round diamond rings are one of the most popular engagement rings. This is because the round brilliant cut diamond has a very versatile shape. It suits many different engagement ring designs. As round brilliant cut diamonds have no corners, they can be set in round diamond rings in many different ways. They are not restricted by their shape to particular settings. Another reason that round brilliant cut diamonds are so commonly used, is that they are available in sizes from 1 mm upwards. Other diamond shapes are not cut in such small sizes. So for the small diamond content in round diamond rings, and in other diamond cut designs, the round brilliant cut diamond is often the only cut available. The first round cut diamonds were very basic. They were not really very round at all. This was due to the method of cutting and the equipment available at the time. As technology improved, so too did the cut. This meant that we moved from a round and lumpy cut called the “mine cut”, to the “antique brilliant” cut (among others). These were often only fairly round and were quite varied in their cut. Although if you look at round diamond rings of this era, the old cuts were certainly very beautiful. Around 100 years ago, a mathematician called Marcel Tolkowski calculated what he believed to be the perfect round brilliant cut parameters. He based this on the angles of light refraction. Diamonds cut with fewer and larger facets show bigger flashes of light than diamonds with many smaller facets. These flashes of light are less frequent, but very intense. Diamonds that are cut with a large number of small facets have a more “glittery” effect. This is not seen as desirable. Marcel Tolkowski gave specific values to the table width, pavilion angle, crown height, girdle thickness and facet size. Then he came up with an optimal diamond cut of 57 facets. This number seemed to give round diamonds the best balance of facet size. The “Tolkowski Brilliant” was born. These days Certifying labs like the Gemological Institute of America (GIA) spend much of their research time perfecting cut parameters. They have fine tuned some elements. For example, they have increased the table width tolerance to between 53 – 62 % of the diamond’s total diameter. It has been said that the most recent advancements in diamond cutting technology has improved the Tolkowski brilliant by around 5-6 %. Considering the tools and technology that are available to us today, Marcel Tolkowski was not too far off the mark. These days the cut parameters are so fine tuned that grading laboratories can give diamonds a cut grade from “poor” right through to “excellent”. Even with all the technology available to us, most diamonds do not reach an “excellent” cut grade. Clearly an “excellent” cut grade is not so easy to achieve. Otherwise every round brilliant cut diamond ever cut would be an excellent cut. It should be noted that fancy cut shapes such cushion, emerald, oval and princess cut diamonds (to name but a few), are not given a cut grade. This is because their cut varies so much from diamond to diamond. It is not possible to have a “one size fits all” formula to suit all the variations in cut shapes. If you want your engagement ring to sparkle, have the best cut diamond possible. The best cut produces the best display of light refraction. Choosing a great diamond is all about achieving a balance in the quality elements. The round brilliant cut really benefits from being well cut. This is of more benefit to the look of the diamond than having a clarity grade that is higher than VS1. As with all diamond selection, sound advice is critical. 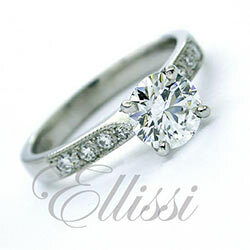 Please do not hesitate to contact us at Ellissi if you have any questions or would like to make an appointment for a diamond engagement ring consultation.